Which MSS state has won the most Gold medals in the MSSM chess championships? GiLoCatur can provide the statistics only from 2010 editions as per below. 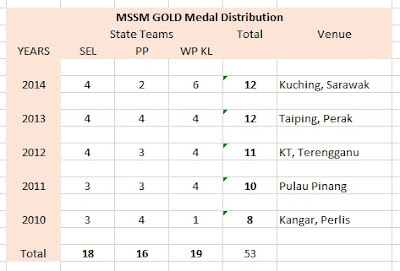 There are three states which really dominate the MSSM chess championship especially in winning the Gold medal. Since 2010, these states have won 53 out of total 60 Gold medals in the 12 categories. In fact, in the past two years the Gold medal are only won by these three states. WP KL wins the most number of Gold medals in the past five years winning 19 of them. Whereas both Selangor and Pulau Pinang have won 18 and 16 Gold medals respectively. Last year, WP KL won six (6) Gold medals, its best in the past five years. So, for 2015 Edition which state will win the most Gold medals? Can WP KL maintain its best record last year? Or would Pulau Pinang win the most number playing in the home turf? Can Selangor win three or four Gold medals as usual?